A beer that is something of an evolution of Feral's all-conquering Hop Hog, via some hop driven internecine warfare with Swan Valley neighbours Mash Brewing and the odd name change. 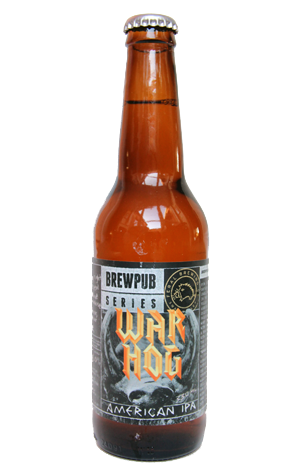 Essentially, it's the beer that has been pouring at Feral's brewpub and, on occasion, at the country's better beer venues as Feral Cat, but tweaked and packaged under the new name of War Hog. It's pitched as an American IPA yet clocks in at 8 percent ABV, perhaps a future-proofing nod to the fact that, over time, the brewery has "downgraded" its 5.8 percent ABV from India Pale Ale to simply Pale Ale. Behind the foreboding label lurks the sort of quality hoppy drop we've come to expect from Feral: heaps of clean citrus and tropical hop aromas and even more in the way of persistent hop flavours. It's comparatively less sweet than sibling Hop Hog, yet there's enough balancing malt there to ensure that, while you know there's a small army of IBUs marching over your palate, their jackboots aren't being planted too aggressively.